Grow organic greens right out of the bag! Pet Greens Garden and Medley are 100% certified organic seed and soil mixtures in a ready-to-grow bag. Just add water and in about a week, you’ll have an all-natural, nutrient-rich treat for your pet! Cereal grasses benefit your pet’s health by aiding in digestion for all animals, helps control hairballs for cats, provides calcium for reptiles and birds love to juice and prune the blades. 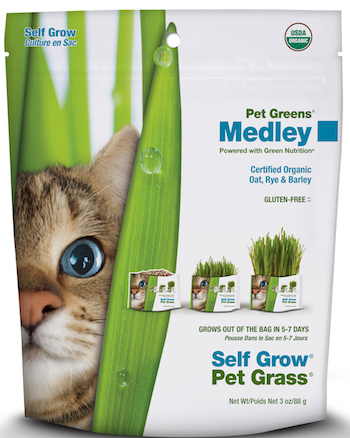 Try our new Pet Greens Medley blend of oat, rye and barley grass – 100% certified organic and naturally gluten-free! Preferably before tearing open the bag, turn it over and carefullymake about 10 small holes in the bottom with a ballpoint pen, largepaper clip or other sharpish, poker-type thing. PLEASE be careful notto poke your fingers or other body parts! Remove the small foil packet of seeds and the laminated growinginstructions card from the bag. Oh! Maybe you don’t have the littlecard, which is why you’re reading this instead. Makes sense. Open the foil packet and spread the seeds evenly across the top ofthe soil. Then lightly mix the seeds into the top 1/4 inch of soil – justenough so that they are covered, but not too deep. Place the bag on a saucer or in a shallow bowl. An aluminum pie panworks great, too. CAREFULLY pour about 1 cup of water into the bag,trying not to disturb the seeds as much as possible. Once the watersoaks in, if there are a lot of seeds resting on top of the soil you canjust poke them down a bit with your finger. Place the bag and saucer/tray in a warm, out-of-the-way place thatdoes not get a lot of light. Check the bag daily to make sure the soilstays moist, and water as needed. Your seeds should start to sprout in about 3 days. Once you see thelittle sprouts poking up out of the soil, move the bag and saucer to abright, well-ventilated location (although not in direct sunlight). Atthis point you want to water about every 3 days, or more frequently ifnecessary to prevent the soil from drying out completely. “Grass care Instructions” on this website. Pet Greens Live Grass typically lasts about 2-3 weeks. Follow theinstructions below to maintain healthy growth and keep your Grass freshand delicious for its full life-span. Grass cannot be re-potted and shouldbe replaced on a regular basis. Water your Cat Grass about twice a week. The best way to water your Cat Grassis to place the container in a saucer and water it from the bottom. Make surethe soil stays moist but do not let your Cat Grass stand in water. Place your Cat Grass in a bright, well ventilated location. Avoid direct sunlightand/or hot locations. A bright kitchen window is ideal! Cat Grass is considereda leafy green. 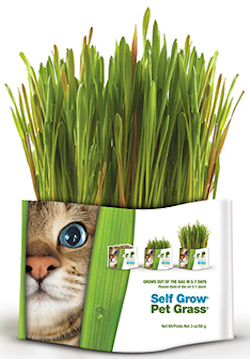 The best way to extend the life of your Cat Grass is to put thecontainer in the refrigerator at night. Feed to your pet as a healthy reward or snack. 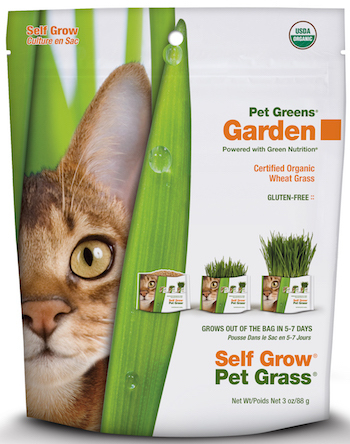 Cat Grass can be fed to cats,dogs, birds, reptiles, and small animals. Adjust the serving size according to thesize of your pet. Reptiles and small animals should only be fed small amountsof Cat Grass. Consult your veterinarian for more information about the properserving size for your pet.